Villa Paraiso is located in a private compound consisting of 10 villas with a shared garden and pool. You will always find a staff member to welcome you and help you with you luggage, wash your car (tips appreciated) and make your Acapulco vacation more comfortable and enjoyable. Our Villa (#7) is the only Villa adjacent to the swimming pool and sundeck. There is a private terrace off of the living room which overlooks the bay and swimming pool, making it a perfect spot for evening cocktails while watching the sunset over Acapulco bay. This compound is never crowded as these are second and third vacation homes for the majority of owners and exclusivity is the rule! Our two story, 1600 s.f. fully equipped Villa is tastefully decorated and well maintained. Marble floors and staircase inlaid with fine wood, designer furnishings and replicas of original paintings from the Great Masters such as Miro, Matisse, Degas, Picasso, etc. grace the walls. The living/kitchen area as well as each bedroom have separate central air conditioning units as well as ceiling fans. Recessed halogen lighting with dimmer controls offer mood lighting in every room. The main floor consists of a living room with an entertainment unit which houses a 32' LCD screen SMART INTERNET TV with premium channel cable, DVD player and a CD/Stereo. There are speakers in both the outdoor terrace and outdoor dining room. The fully equipped kitchen has a pass through bar with three stools for informal dining. A hanging wine glass rack is equipped with wine and champagne Martini glasses! There is also a half bath just off of the kitchen. One of the most spectacular views is found in the outdoor dining room under a palapa palm roof, offering dining for up to 8 guests with mood lighting or candle-lit chandelier. There is also a pass-thu bar from the kitchen for easy service. A large gas grill is available for bar-b-que cooking as well. The master bedroom is located on the second floor as well as a private jacuzzi tub for two on the private terrace covered by a palm palapa roof.. This is the perfect spot to enjoy your morning coffee or evening cocktails while relaxing to the spectacular bay views. The master offers a king size bed and a chaise lounge sofa in order to enjoy the panoramic views from the large window. There is a 32" flat screen LCD TV, DVD player and CD stereo to compliment your enjoyment. The master bath offers a marble vanity with a bathtub and plenty of mirrored vanity space. Daily maid service can be arranged at a nominal fee. We are retired from the hospitality industry and owned a Wellness Spa in Cuernavaca, Mexico. Choosing our vacation home in Acapulco provides us the opprtunity to get away for the weekends while not having to travel far from home, as Acapulco is only 2 hours drive from Cuernavaca. Our dream was to have a vacation home in Acapulco where we could get away from it all and enjoy the afternoon sunsets overlooking Acapulco Bay. We looked at over 30 properties before deciding to purchase 'Villa Paraiso' which means 'Paradise Villa' in Spanish. The Villa is ideally located within minutes of restaurants, shops, nightlife and the best beaches of Acapulco, yet removed from the hustle and bustle of the city. Every room has a view of the bay which was one of the primary requirements when looking for our 'litte bit of paradise'. Morning coffee on the terrace and feeling the cool ocean breezes, afternoon cocktails while watching the sunset paint the Acapulco bay skyline and relaxing evenings soaking in the outdoor jacuzzi off of the master bedroom terrace while seeing the Acapulco nightlife take place below are just a few of the reasons Villa Paraiso is the ideal vacation home. Full china and flatware service for 8 persons including linen tablecloths. Orlando has a very nice home with a great view of the bay. The house was fully stocked, spacious and very clean! Orlando was very attentive to our needs and always available via text to handle issues and offer advice on things to do and places to visit. We enjoyed our time here and would certainly stay again the next time we are in Acapulco! We strive to keep our home in top conditions offering amenities such as a fully stocked kitchen, abundant quality linens and towels, full HD Cable TV and WiFi Internet in order to assure our guests an exceptional vacation stay. This was our second trip to Acapulco in the past five years. The city always feels safe and we walked everywhere. 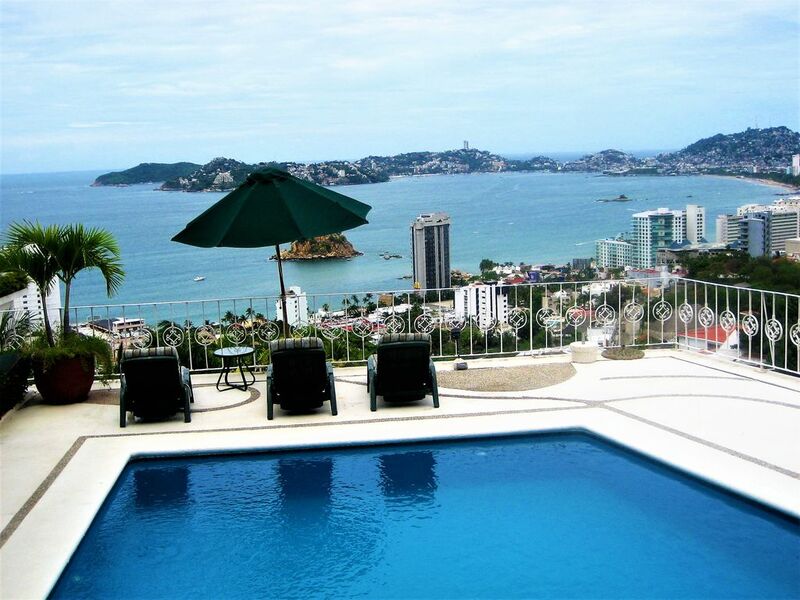 The villa is located near the top of the most exclusive hill in Acapulco. It is a short walk down the hill to the main strip along the famous beach to the best restaurants and hotels. Although my wife and I enjoyed walking up the hill back to the villa many times we preferred taking a taxi which cost 30 pesos or roughly $2.00. Once at the top of the hill, behind the walls surrounding the villa, it is absolutely quiet. The villa is clean and every window has a more spectacular view than the next. Two sizable bedrooms, two floors, three bathrooms, two pools, hot tub, private enclosed parking place with electric garage door, fully equipped kitchen all directly overlooking the bay with a breathtaking unobstructed view. None of the attached pictures does the villa justice. We felt like we were staying in the lap of luxury far exceeding our expectations. The owners were there to welcome us and were always available to answer any questions. Centrally located in the heart of Acapulco Bay, Villa Paraiso offers an array of dining and nightlife options within 5 minutes as well as shopping and of course, the best beaches for sun and surf. A $300 USD Damage Deposit is required in cash upon check-in and will be returned to you upon final check-out inspection.